The Australian Dietary Guidelines encourage Australians to eat a variety of grain foods as part of a healthy diet. 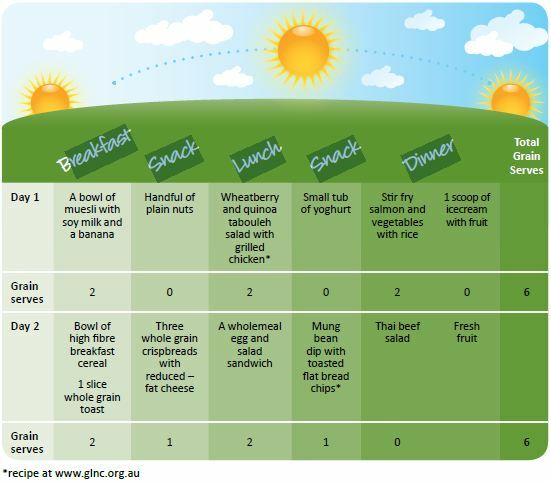 A factsheet has been developed to help explain the Australian Dietary Guidelines for grain foods. To download a copy click here. The guidelines recommend people ‘eat a variety of grain (cereal) foods, mostly wholegrain and/or high cereal fibre varieties, such as breads, cereals, rice, pasta, noodles, polenta, couscous, oats, quinoa and barley.’ Refined core grain foods, like white rice and pasta, can be enjoyed as long as other grains in your day are whole grain or high fibre. Core grain foods including breads, breakfast cereals, crispbreads, rice, pasta and noodles are primary contributors of fibre, thiamin, magnesium and iron in the Australian diet. Non-core grain foods are high in salt, fat or added sugar, including cakes, pastries, biscuits, chips, pies and sausage rolls. Refined core grain foods including white bread, rice, and pasta are core grain foods and may be included if the other grain foods in your day are whole grain or high fibre. How much is a ‘serve’ of grain-based food? It’s easy to get 6 serves of grain foods every day, and with a little planning, easily make half of them whole grain or high fibre. This leaves room for some refined grains such as white rice, white pasta and white bread. GLNC recommends people enjoy grain foods 3 – 4 times a day, choosing at least half as whole grain or high fibre. Check out these simple meal ideas and see for yourself. For more information on the Australian Dietary Guidelines click here. 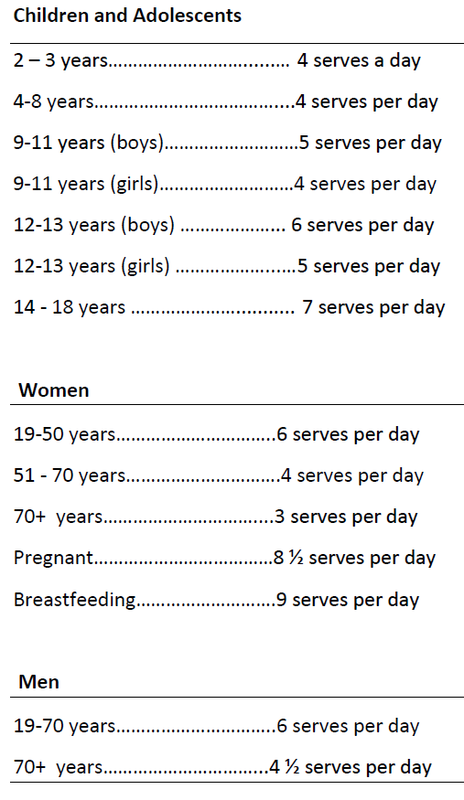 The Australian Dietary Guidelines are general recommendations for healthy people. For individual nutrition and dietary advice see an Accredited Practising Dietitian (APD). To find a dietitian near you visit the Dietitians Association of Australia.